[1-Pack] hiccapop Inflatable Bed Rail for Toddlers | Travel Bed Rail, Blow-up Bed Bumper with Non-Skid Water-Resistant, Non-Slip Removable Cover | Portable Bed Rail for Hotel, Grandma’s, Vacation by hiccapop at My Pregnancy Place. MPN: HP-IBB. Hurry! Limited time offer. Offer valid only while supplies last. Looking forward to holiday travel, a day trip, or simply visiting friends and family but worried about finding child-friendly sleep accommodations? View More In Safety Equipment. Looking forward to holiday travel, a day trip, or simply visiting friends and family but worried about finding child-friendly sleep accommodations? Have the hotel porta cribs been unsafe or unavailable? The hiccapop inflatable bed bumpers are your perfect answer. They install quickly and securely on any type of bed, and they come with their own carry bag! Wherever you sleep, you will be more peaceful knowing your child will be slumbering comfortably and safely nearby. Are you seeking an alternative to your toddler sleeping in a 'big boy' bed while imprisoned in cumbersome traditional, bed rails? Invented at Stanford University based on the principle of "Passive Safety Protection", the gentle touch of the soft bumper triggers your child's "Passive Safety" response, letting them know they are close to danger and should move away. The safety flap extension adds an active second level of protection not found on other bumpers. If your child's bed has 2 open sides, add 2 bumpers to your cart and save 15%. Engineered to Resist Tiny Tsunamis - Water-resistant nylon cover and waterproof vinyl bladder make sure those inevitable nighttime whoopsies won't be the debacle they used be. Leak-Proof Durability and Craftsmanship hiccapop's inlay-enforced vinyl is 40% thicker than its nearest competitor, making it virtually puncture-proof. Reinforced weld-seams and a heavy duty air valve ensure against air leakage. 100% Lifetime Guarantee - At hiccapop we are dedicated to providing cutting-edge products and unparalleled customer service. Why Buy the hiccapop Inflatable Bed Bumpers? COMPACT/CONVENIENT BED RAIL FOR TRAVEL | Handy push-button release valve quickly deflates bumpers to lightweight and space-saving size. Comes with travel bag for protection and easy portability for packing in your suitcase, popping into your car or in carry-on for plane trip. ***ADD 2 BUMPERS TO YOUR CART TO SAVE 15%. *** You need 2 for beds without a wall on 1 side. CUTTING EDGE NON-SLIP DESIGN | Our safety-obsessed design team brings you the next generation of portable bed bumpers. Unlike bumpers that rely only on thin non-skid strips to maintain position, hiccapop's new safety flap extension uses child's weight to anchor the bumper firmly in place. Assures even the most active sleeper a safe night's slumber while you rest nearby with peace of mind. A GREAT DESIGN THAT DOESN'T LEAVE YOU BREATHLESS | Designed to inflate in seconds for a full and tight bumper. Saves your breath for your little one's lullaby. 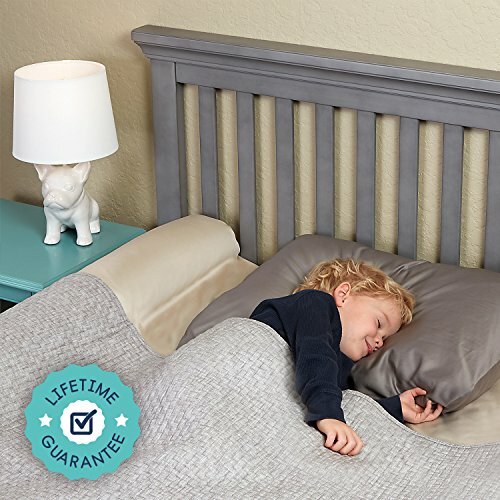 SLEEP SAFE AND SOUND ON THE GO | Perfectly suitable for any bed during sleepovers at friends' houses, in family guest rooms or hotels, on Grandma's pull-out bed, or in your RV. Wherever you decide to trek, both you and your tot will rest easy. SAFETY CERTIFIED AND BEYOND | At hiccapop, children's well-being always comes first. That is why we take it upon ourselves to rigorously test and retest our products for optimal safety and functionality after all CPSC and ASTM regulations have been met and certified. If you have any questions about this product by hiccapop, contact us by completing and submitting the form below. If you are looking for a specif part number, please include it with your message.